Music Director James Levine has long championed Verdi’s majestic opera that pits a ruler’s public duty against private desires. Aprile Millo is Elizabeth of Valois, engaged to Don Carlo (Michael Sylvester), heir to the Spanish throne. But their love is thwarted when his father, King Philip II (Samuel Ramey), marries her himself. 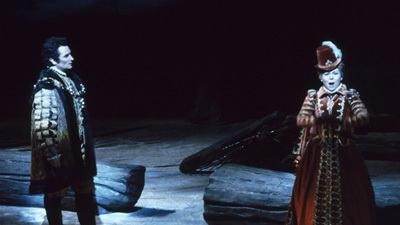 Dolora Zajick is Princess Eboli, the king’s mistress who is also in love with Don Carlo. Vladimir Chernov is Don Carlo’s best friend, Rodrigo, and Sergei Koptchak is the imperious Grand Inquisitor.